Welcome to our Abdul's blog. Here you'll find a host of things including cookings tips, new dishes and all the latest news! 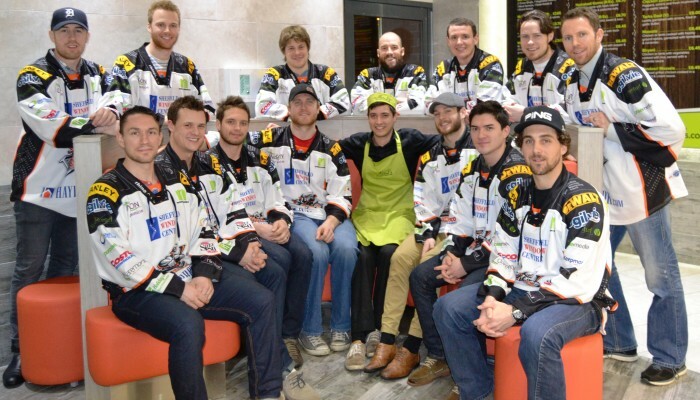 The Sheffield Steelers ice hockey team certainly felt the heat last week, when they visited our Sheffield based diner, to help launch the Steelers Super Spicy curry – a dish named in their honour. The players, who visited the diner last Thursday, forgot all about the ice rink for the evening when they we asked them to ‘thaw out’ and sample the Steelers Super Spicy Curry, as well as a selection of their favourite dishes and side orders. The team were great fun and a really friendly bunch of guys – we’re happy they chose to come along and sample our menu – they are certainly now our number one fans and after their recent win we will be watching them more closely now too! Team Captain, Steven Goertzen gave us great feedback, commenting that the food at was amazing and the staff and management made it an extremely satisfying and accommodating experience. It just goes to show though that not everyone can handle the heat when they come into our kitchen, some of the players found the curry a little too spicy saying, although it was delicious, the Steelers Super Spicy Curry definitely has a kick to it! As you can see from Tim Spencer’s face in our picture (far right)! A great night was had by all and on behalf of all the team at Abdul’s, we would like to thank the Sheffield Steelers for taking the time to come and pay us a visit and of course sample our new Steelers Super Spicy Curry. We hope to see them all again very soon. Why not see if you can handle the heat and try out our new Steelers Super Spicy Curry the next time you visit Abdul’s Sheffield. But be warned if you can’t take the heat – you shouldn’t be in Abdul’s kitchen. All major credit/debit cards accepted, cheques accepted with a guarantee card.